The Maxwell Street Foundation concluded its 2018 season at the New Maxwell Street Market on Desplaines Avenue in October. 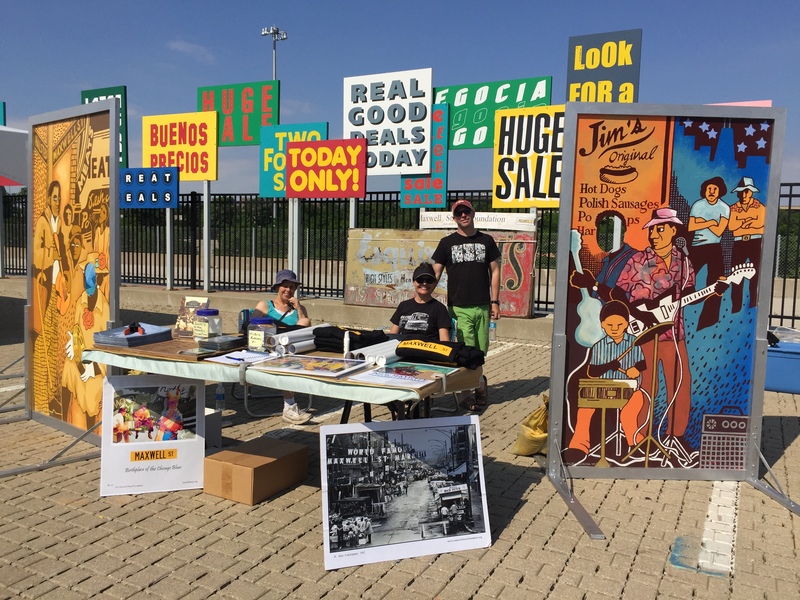 Members vended a variety of Maxwell Street-themed items ranging from books to posters and T-shirts, and engaged in good conversation about Maxwell Street history and the continued vibrancy of the marketplace on Desplaines. Please continue to shop for our selected items on our website at maxwellstreetfoundation.org/support-us, and continue our conversations by telling your authentic Maxwell Street stories at SUBMIT YOUR STORY. THE MAXWELL STREET MARKET CONTINUES TO OPERATE EVERY SUNDAY OF THE YEAR ON DESPLAINES AVENUE BETWEEN TAYLOR AND POLK STREETS, 7:00 AM TO 3:00 PM, where you can find bargains, authentic street food, and unique gift and food items. There is limited FREE parking on Desplaines Ave. from Harrison to Polk, and on Desplaines Ave. from Taylor to Roosevelt. For more information contact cityofchicago.org/city/en/depts/dca/supp_info/maxwell_street_market.html. The Foundation thanks the Department of Cultural Affairs and Special Events (DCASE) who run markets citywide, for their support of the Maxwell Street Foundation at the Maxwell Street Market and the celebration of its legacy as Chicago’s longest-standing and official open-air market created by city ordinance in 1912. The Maxwell Street Foundation will resume its presence at the Market in April 2019. See you then! All images published by the Maxwell Street Foundation within this website are copyright of the artist and are for educational, personal, and/or noncommercial use only. For any other use, please contact gro.n1555621763oitad1555621763nuoft1555621763eerts1555621763llewx1555621763am@of1555621763ni1555621763.